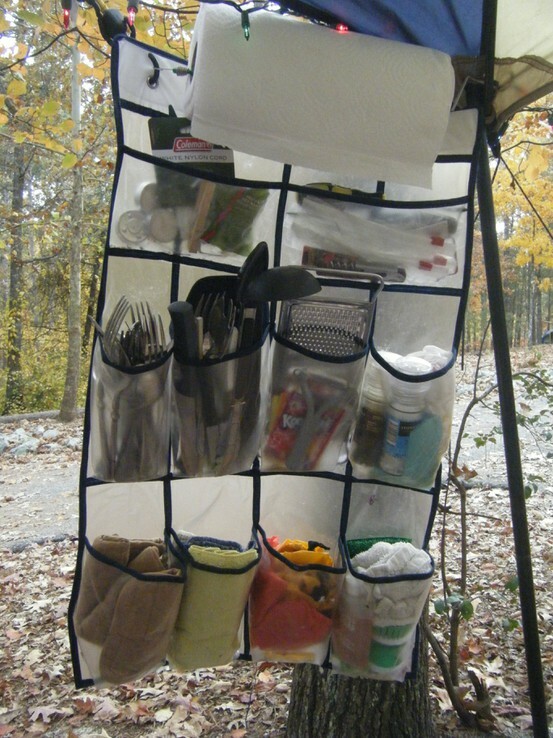 Margie Barnett on Pintrest uploaded this shoe organizer that she has used for her camp kitchen. Using a shoe organizer is smarter than my setup because it is easier to buy at the store and it folds up flatter than the organizer I used. The only problem I have with this setup is that I suspect that cutlery and utensils would fall out of the pockets during transit, so I’d have to set it up EVERY time. Other than that, it looks like it would be a good way to organize things whether you string it up on your camp kitchen or hang it from your awning like this picture. Take out the 3 long cooking utensils and the grater. Lie the whole organiser on the floor. 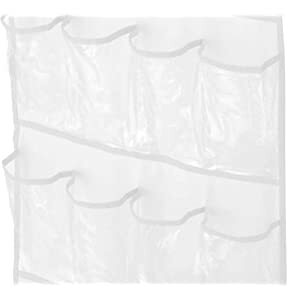 Fold the organiser by folding the top row over onto the middle row, and then fold the bottom row over onto the middle row. Keeping the organiser folded like that, will keep everything in place. And you may even be able to fold the 3 long cooking utils. and the grater into it as well, by lying it on top of the middle row, before folding.